I’ve never been disappointed in a Brian Wood book, so when I ran across Briggs Land: State of Grace (Volume 1), I knew I had to check it out. I’m so glad I did. The premise is perhaps as relevant as ever in that Briggs Land is a self-proclaimed sovereign nation within the United States. It has existed since the Civil War, and it’s been a place anyone can go who wants to live an unfettered life. 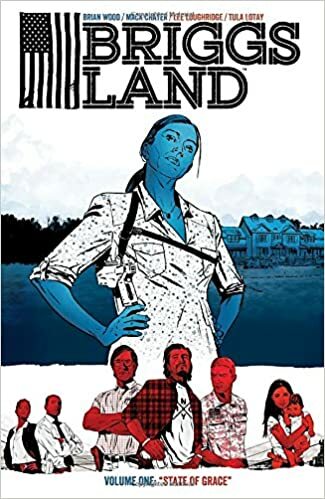 However, that simple life grew more complex as the years passed, and Briggs Land is now a magnet for extremism, white supremacy, corruption, and domestic abusers. The current patriarch, Jim Briggs, has been incarcerated for years, but that hasn’t stopped him from ruling Briggs Land with an iron fist. Yet, his wife, Grace, suspects he means to betray their people, and she can’t allow that. Grace, who married Jim as a teenager, takes control of Briggs Land, and virtually no one is happy about it. She must contend with her murderous husband, her conniving grown sons, her treacherous daughters-in-law, her unpredictable citizens, and even the federal government. But trust me, if anyone can bend Briggs Land to her will, it’s this woman. Of course, as a graphic novel, I would be remiss to ignore Mack Chater’s artwork. Chater’s talent is uniquely suited to Briggs Land. It’s a little rough, yet incredibly detailed and well rendered. It fits the tone of this book perfectly, as well as the characters themselves. I’m not sure I’d like this style in a Superman book, but this is nothing like a Superman comic. Now that I’ve experienced the first volume, I can’t imagine anyone else drawing this title. It’s a perfect match. This is a deeply political book featuring violent, manipulative characters. In fact, I can’t say anyone is particularly innocent, especially the protagonist, Grace Briggs. However, Grace does have a sense of justice deep within her, but it’s still not apparent how universal that justice is. She is incredibly helpful to some in need, but I’m not convinced her charity is available to all. Though the book may not sound like a must-read, believe me when I say it is a captivating story delivered with excellent pacing. Brian Wood is a master at using story to subtly explore contemporary political and societal issues. I quickly found myself engaged with the characters and utterly drawn into the unfolding plot. I completely recommend Briggs Land. This entry was posted in Book Reviews and tagged art, Book Reviews, books, brian wood, briggs land, comic books, dark horse comics, entertainment, graphic novels, mack chater, read, reviews.